In 2007, the Montana Legislature enacted the state's beneficiary deed law, found at Montana Code Annotated Section 72-6-121. All following parenthetical references identify the part of that section which contains additional information. The statute outlines the requirements for a beneficiary to gain ownership of real property from a beneficiary deed at 72-6-121(12). The process involves completing and recording an affidavit of death. This document must contain the information specified in 7-4-2613(1)(c), including recording details from the beneficiary deed, a full legal description of the property interest, names and addresses of all surviving grantee beneficiaries, and evidence of the owner's death. In addition, attach an official copy of the deceased owner's death certificate. 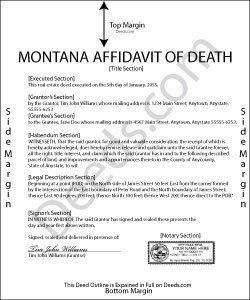 When the affidavit of death is completed and notarized, submit it to the clerk and recorder in each county in which the real property or any part of the real property is located. Beneficiaries take ownership of the property subject to any mortgages, taxes, and obligations of record (1), including claims from the department of public health and human services may assert a claim pursuant to 53-6-167 for medical assistance (7). Because of these or other reasons, some beneficiaries may decide not to accept the transfer. In that case, follow the procedures outlined in 72-2-811 to disclaim the interest. Each circumstance is unique, so contact an attorney with specific questions or for complex situations.